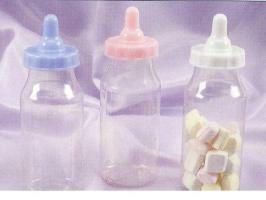 5" tall large fillable baby bottle. Perfect for baby shower favors! 5" tall fillable baby bottle. Perfect for baby showers! Fill with mints, jelly beans, favor crystals, etc.. Just tie a bow around it and you are set!